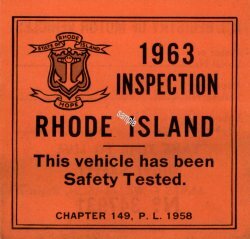 1963 Rhode Island Inspection Sticker - $20.00 : Bob Hoyts Classic Inspection Stickers, Add a Final Touch to your Restoration! This 1963 Sticker measures 3 inches x 3 inches and is a beautiful reproduction of the original sticker. Rhode Island stickers do not indicate the month of issue or expiration date.